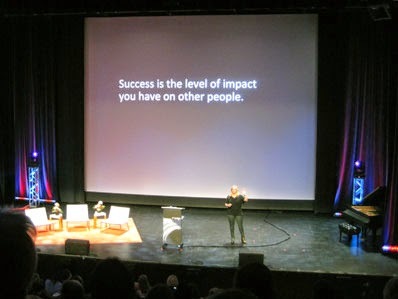 October 22 and 23, 2014: Mike Ivers, of the Yuma Community Food Bank, opened the seventh Cusp Conference at Chicago’s Museum of Contemporary Art with this charge: “Turn turbulence into triumph.” It inspires resilience in the face of current events. Its meaning, from one relative state into another, coheres with these themes that I found to flow among the event’s speakers. The evolutionary biologist Richard Dawkins said, “There’s real poetry in the real world. Science is the poetry of reality.” This came to mind as I experienced biological anthropologist Julienne Rutherford’s presentation about the innate connections between our bodies and the fetus. She duly noted the body as “a distinct part of our existence.” Whether or not it is truly good or bad design, the human body is a fascinating reality, and poetically speaking—a work of art. She also noted the “aquatic world of the fetus.” This brought to mind the aquatic composition of both our bodies and our planet. The human body is mostly water—approximately 60% as an adult. The surface area of the earth is 70.8% water. Water takes the shape of us and we strive to reciprocate. Rutherford posed a deep question: “What is a placenta?” It is the organ, which connects the developing fetus to the wall of the uterus, to support pregnancy and birth of a new human being. To exceed the flatland of this definition, the placenta is portrayed, by Rutherford, as the original shaper of our lives. It is a highly influential medium, between mother and child—“From womb to womb” as Rutherford (above) elegantly put it. 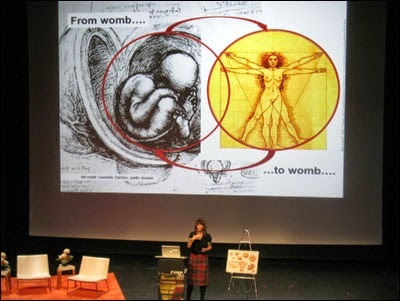 In the conclusion of his book “Interface Culture” (1999), Steven Johnson stated, “The interface came into the world under the cloak of efficiency, and it is now emerging—chrysalis-style—as a genuine art form.” If the fetus is a floating world of signals and information, the placenta is its anchor, the ultimate interface of the imagination, whose potential scope Rutherford does not underestimate. When openness is achieved, access is gained, whether it is to dialog, information, services, technology, and more. Behavioral scientist Nicholas Epley shared experiments, which he led, that investigated philosopher Aristotle’s claim that humans, are, “by nature, a social animal.” Particular emphasis was given to people’s expectations about social interaction. The findings revealed the mistaken projections by people regarding face-to-face conversation. Participating in the studies, people—who jumped to conclusions that personal interaction would be shallow, on account of themselves or the stranger to which each was prompted to draw into conversation—wound up being wrong. Whether the setting was a train car or a taxi cab, people experienced a positive, even uplifting, effect after talking to someone, even when the interaction was short-lived. My habit of greeting people, within the close quarters of an elevator, felt justified. 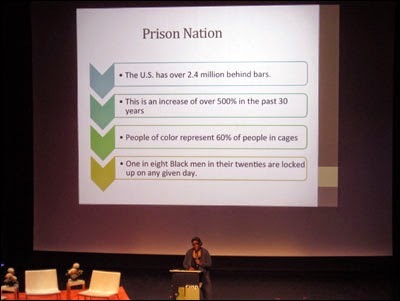 Her vision of “A world without prisons” speaks to systems made to promote humanity, rather than be systemic in their disinterest of the human condition. 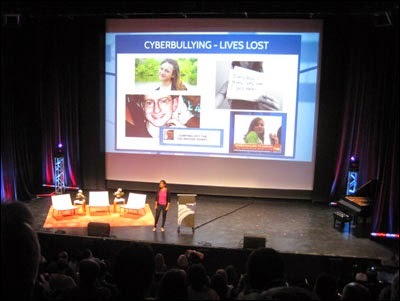 To be within reach of sensibility—a sanity check—is what Trisha Prabhu is advancing, with her long-term solution to cyberbullying. Called Rethink, adolescents are prompted with a prime directive to reconsider their harmful words, and prevent the harm that would have been done to the message’s recipient and to the adolescent messager her/himself. Play is pressed on as a stimulant. Pausing, for self-examination, is equally, if not more, significant. Access to timely intervention is defensive serendipity. Kel Smith spoke about accessibility from a user-experience standpoint. He testified to the excessive tidings of empathy. Innovation is also excessively prophesized. 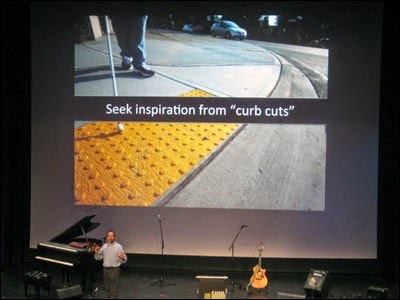 But Smith’s goal of “innovation” is direct: “To extend human capability.” The results of this dictate do (adding to the excess of another used term) “scale.” They can be grounded, appear deceptively moot, but are effective, as in the example that Smith highlighted: curb-cuts (below). Subtle in presentation, but to a visually-impaired person, a critical landmark of orientation. Designer and inventor Tom Lawton (above) declared that there is a fertile source of ideas: “Everywhere.” Lawton’s imagination is fed as a parent, as a resident in Malmesbury (in the county of Wiltshire, England), as a photographer, and as a traveler. These roles enchant Lawton, for they enable him with possibilities to gather keen observations in order to arrive at creative possibilities, as Lawton simply put it: “I live life true to myself.” Much is advertised about galvanizing the quality of authenticity in making things. The living that Lawton cherishes—at home, his town, abroad—produces a multi-faceted source, in tune with his preferences, which compels him to stir ideas, authentically. When Genevieve Thiers proclaimed, “I am a woman in tech,” pride ensued, alongside a restless struggle. Thiers amplified the glaring absence of women in technological fields. This gap is noticed on many levels. For one instance, the cover design of Walter Isaacson’s new book “The Innovators: How a Group of Hackers, Geniuses, and Geeks Created the Digital Revolution” (after his biography of Steve Jobs) does display Ada Lovelace, the first female programmer, among male figures sharing the publishing spotlight. It ups her singular status as a popular choice representing women in the timeline of technology, but also validates the greater vacuum of female technologists in both the news media and documented history, where women are mainly viewed as prolific members of entertainment, compared to other fields. The fight for gender respect is also embraced by Anne Gibbon, an officer in the U.S. Navy, and who is also a fighter—literally. During her senior year in the U.S. Naval Academy, she became the first woman to box on the side of Navy, earning a TKO in her first fight. Her primary boxing lesson: “If you don’t pay attention to the present moment, you’re going to get hit in the face.” The present tense is tactical awareness. Gibbon’s transition from a military leader, in the U.S. Navy, to lead designer, at BMNT Partners, with an allegiance to the discipline of boxing, is high in contrast. Gibbon takes her advice “to be uncomfortable and to be in the moment” and keeps proving it. Not to just assert herself in the present tense, she walks the talk. Solo work offers a primary entrance. Feats are done by the individual, but the mind can be lonely. Independent accomplishment is deeply felt. When the accomplishment is stretched among other minds, accomplishment satisfies the depth and breadth of effort. This is the sustained completion of a moving goal, worked on, most of all, shared. Charna Halpern, co-founder of The iO (formerly known as ImprovOlympic), reinforced that work must not be a dry exercise of mind over matter. To help lighten work’s mechanics is humor, which, from an improvisational-comedy angle, fosters both kinship and collaboration. Halpern pioneered improv as a “theater of the heart.” In this type of work environment, no gatekeeping of ideas, instead, ideas are freely extended and bloomed into play without prejudice. The talk of Roger Jackson, creative director at Teague, was a proactive ode to teamwork. 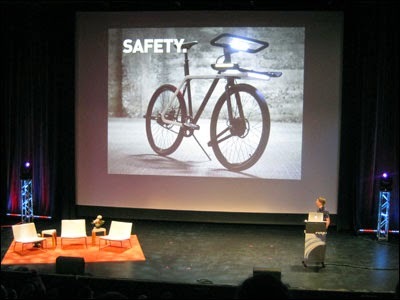 He shared Teague’s participation in “The Bike Design Project” of non-profit Oregon Manifest. Their submission was voted the winner. Based on the demo-videos, Teague’s version of, from the competition’s description, “the ultimate urban utility bike,” was the apparent choice, particularly the functional (as you’ll see) versatility of its handle-bar concept. Teague’s design-and-prototyping team consisted of five individuals who realized this idea together. Minimal team. Maximum magic. 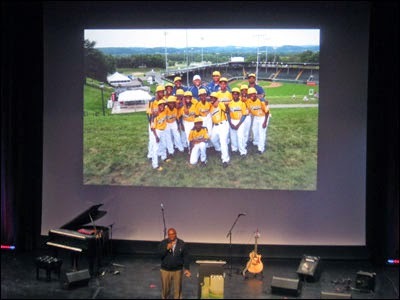 Founded by his father, Joseph, in 1971, Bill Haley has nurtured and guided the Jackie Robinson West Little League in Chicago as player, coach and, recently, director. In August, 2014, his team of 11 and 12-year-old boys won the United States Championship at the Little League World Series. Their victory more than captured the imagination of the city of Chicago. The team captivated its heart. The philosopher, Friedrich Nietzsche, said, “Without music, life would be a mistake.” Pianist Nicole Lee gave interludes, mostly from the classical repertoire. The conductor, Benjamin Zander, believes that “No one is tone-deaf.” Lee celebrated this fact. 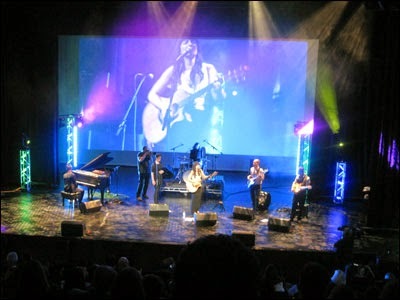 Singer-songwriter Elle Casazza, and her band, gave a live performance of lounge-tinged pop to triumphantly close this year’s Cusp Conference. Taking a cue from Julienne Rutherford, probing our origins, in whatever capacity, from one’s armchair to one’s office, is openness to introspection about the nature of things—of ourselves. Taking cues from Kim Blair, Saliome Hralima, Tom Lawton, people are cabinets of creativity. By dreaming and doing, humans can prove to be capable of making magic. Taking cues from Genevieve Thiers and Anne Gibbon, removing history’s malignant plaque of exclusivity—the respect of gender being one of many dominant issues—contributes to the collective grasp of diversity everywhere. A memorable meeting at the conference was the Mocks family—parents Bill and Tracy with their daughter Samantha. Bill shared that they, together with his and Tracy’s son, Will, are regular attendees of the Cusp Conference. It’s their family tradition. This impressed me! Bill also shared that they’re not the only family who attends. One of the ultimate gifts is perspective. The Mocks are giving their kids a portfolio of worldviews to settle and ripen over time. It corroborates the likelihood that their children will persist the practice by providing such a platform of life-affirming wonder to their counterparts, kindred, “womb to womb,” and beyond. These impressions are from attendees who were positively affected. Their standpoints adjusted in dimension. Mine percolated. 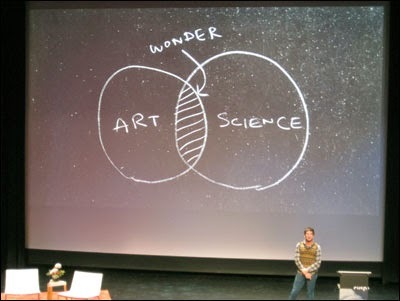 During, and more so afterwards, my striving, to connect bits of wonder in order to make something wonderful, gained more in volume as a sensibility. 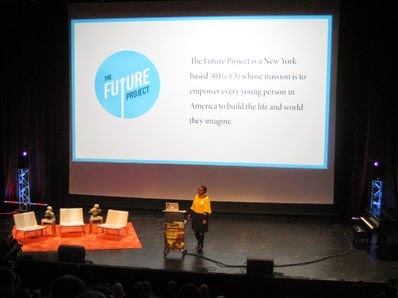 Building on its predecessors, since 2008, the seventh Cusp Conference gave more stimulating passage to concepts and realities for consideration. The beauty is the mystery of how these cultural offerings—delivered by twenty-five presenters over two days—will unfold in influence and play a part in one’s work, one’s life. This is a relevant comfort that can help hone one’s attention to the things one finds brilliant. It can also nourish coping with turbulence, mitigate its grip, and replenish triumph. 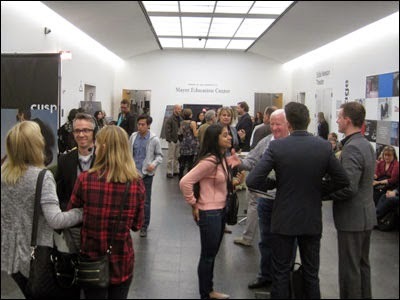 Big thanks: to Multiple, Inc., and the volunteers who made Cusp Conference happen in 2014; to the Museum of Contemporary Art, in Chicago, for hosting. 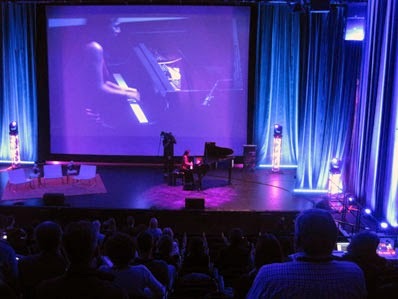 See my photos of the 7th Cusp Conference. 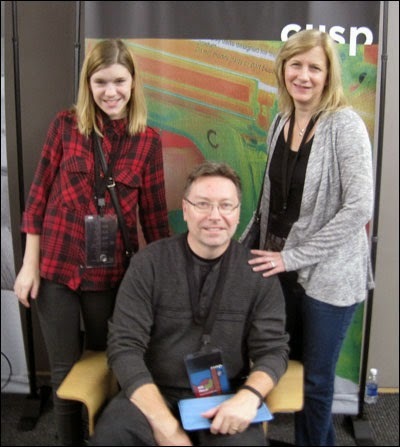 Plus: my write-up and photos of the 6th Cusp Conference in 2013.